This finch uses its powerful bill to break open seeds, which it feeds on throughout the year (5). In winter they may form groups with other finches and buntings (3), and as natural seed stocks dwindle at this time of year, they increasingly rely on artificial food sources, such as bird tables (6). 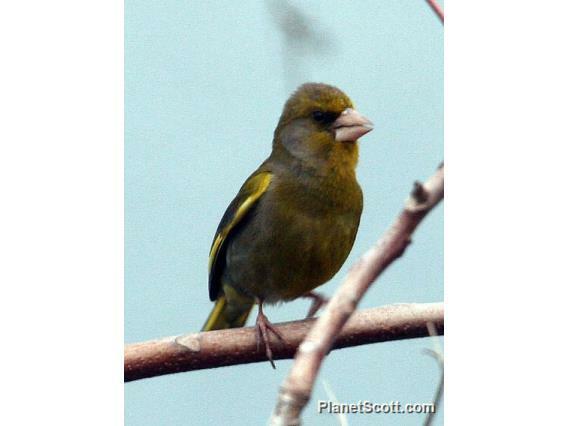 Greenfinches nest in small colonies in trees and bushes (2) and only defend a very small area around their nest. They sing and display in spring and have a characteristic wavering display flight that shows off their yellow wing and tail flashes (5). Between four and six eggs are produced per clutch, and incubation takes up to 15 days. The young are fully fledged 18 days after hatching (3).